The Legacy Fund is a way for graduating seniors to give back to Catholic Campus Ministry at the Newman Center. With a monthly pledge over 3-5 years, you as a young alumni can make a big difference, even straight out of college! Make a pledge online, or download and print the 2018 Legacy Fund Pledge Form. Your gift will be added to the Campus Ministry endowment. Endowments work through investments. By investing large sums of money into the Campus Ministry endowment, the endowment earns interest. Newman will then draw from the interest earned to use as a part of the annual campus ministry budget. The initial endowment gift continues to be invested year after year, allowing your gift to continue to impact the ministry for – literally – a lifetime! Why should I support the class gift? The Legacy Fund touches every area of Campus Ministry. No matter how you were involved, your time at Newman was, in part, made possible by alumni who supported you. Our God calls us to be generous with the gifts given to us; giving of your resources is one way you can return your blessings to God. In addition, this special opportunity to give to the endowment will make a big difference over your lifetime – a truly life-long gift! You can make a pledge to the Legacy Fund today and then whenever you’re ready, you can start giving with a monthly gift that will go towards that pledge. You can start, increase, decrease, or hold your gift at any time if you set up an account with your online pledge (or by contacting Newman if you choose not to set up an account online or if you choose to have funds withdrawn from your checking account). Do I have to select one of the pre-set pledge amounts? 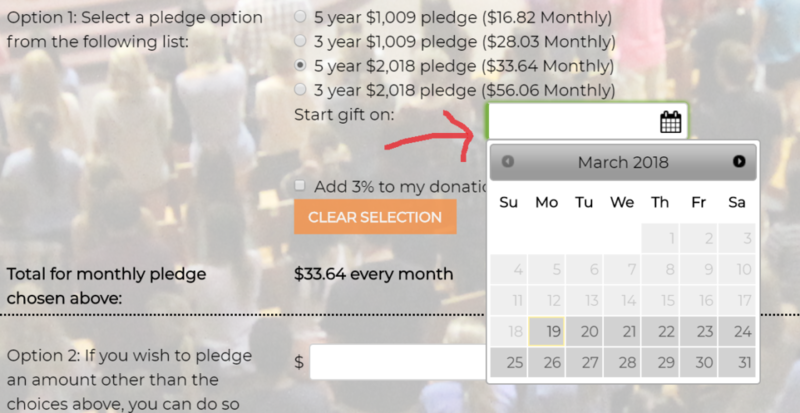 No, you can choose to pledge any amount you like. The pledge amounts listed are standardized goals, but do whatever works for your budget! If you are going on to graduate school or giving a year of service, it may make sense for you to pledge $5 or $10 a month for right now. You can always increase, decrease, pause, or stop your pledge as needed. You can make changes by either creating an online account when making your pledge or by contacting JoAnn Shull. Can I defer the start date? Yes! Once you select your pledge amount, you will have the option of choosing a start date - either today or a date in the future. We ask that, to be counted towards your class' gift, you start payments on your pledge by the December after your graduation. Do I have to pay with a credit card, or can I give through my checking account? If you wish to have your gift drawn directly from your checking account, you will need to fill out an EFT (electronic funds transfer) form and send it to Newman. This is the most preferred way of giving to the Legacy Fund as Newman incurs no processing fees and there is less work you need to do as your banking information does not change or expire as often as credit cards. Download the EFT form here and mail back with a voided check. What if I need to change my gift? If you need to decrease, increase, hold, or cancel your gift, you can do so at any time. While we ask for your commitment, we do understand that circumstances may change that necessitate a change in your gift. Your pledge is not a legally binding contract. However, if you need to make a change, please allow up to 5 business days to process your request. Can I wait to pledge until I get a job? We ask that all pledges to the Legacy Fund be made by graduation. While we know this can be an uncertain financial time, you have the option to pledge and defer the start of payments through the December after you graduate. Seniors who commit before graduation will also receive a special gift from Campus Ministry to thank you for all the ways – tangibly and intangibly – you have blessed and will continue to impact our Newman community! Can I talk to someone about my gift? Absolutely! Contact JoAnn Shull. Legacy Fund student ambassadors will also be available for questions starting in October through graduation. We would be happy to chat with you about your options as well as any questions or concerns you may have. Yes!! We need enthusiastic, dedicated soon-to-be graduates who are willing to talk to their friends and fellow graduating class about the benefits of the Legacy Fund. Training is provided and will give you all the tools you need to share information with your peers. Don’t worry – you won’t have to ask people money! For more information, contact JoAnn Shull. 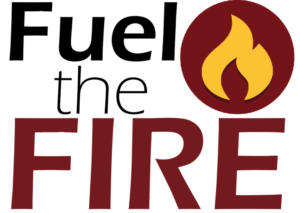 2018: Fuel the Fire - In the second year of the Legacy Fund, 23 recent graduates pledged an amazing $32,040!! 2017: “Planting the Legacy” — New and recent graduates in the founding year of the Legacy Fund in 2017 pledged an amazing $19,865! Their gifts will be added to the Campus Ministry Endowment, ensuring that their gift impacts countless generations of college students in the future.